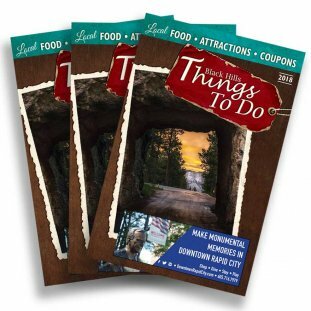 Black Hills Things To Do is a visitor magazine featuring area attractions, restaurants, shopping, coupons & more. It is distributed throughout the Black Hills at popular tourist locations. The companion website is a robust directory/event site which appeals to visitors and locals alike. The site is maintained/updated weekly to ensure the most comprehensive list of events in the Black Hills. Users can find anything from local bands, vendor fairs, classes, special events and more on the site. By creating a free member account they are able to bookmark their favorites and save for later. If your business caters to visitors and locals, we offer affordable packages that will give you exposure in both the printed guide and the online directory. Contact us today for more information!